My dad was a musician. He was French Canadian, and he had a lot of the French Canadian style too. One day I came home from school and he had a mandolin and he was playing “Ragtime Annie,” then he played “Soldier’s Joy.” I said, ‘What is that instrument?’ And he said, ‘The mandolin.’ He played another tune and then he handed it to me and said, “Here!” Never gave me a lesson or anything and I just started playing it. That was my first instrument—and it was mine. It was an old one with the round bottom, we called them ‘tater bugs. That was the first mandolin I had. Quoted by Cameron Little in “Bluegrassian Questionnaire with Roland White—Part I,” posted January 17, 2015 by the California Bluegrass Association. Roland White has a career spanning six decades, during which time he has worked with many of the top names in bluegrass. A consummate musician with his own unique highly rhythmic lead and back up mandolin styles, and a warm and poignant singing style, his music has graced numerous albums, both as a band member and as a guest musician. The most recent phase of his career finds him a bandleader, mentor, and instructor. Of Acadian-French-Canadian ancestry, Roland Joseph LeBlanc was born on April 23, 1938, in Madawaska, Maine, a town that today numbers about 4,000 and is situated in the extreme northern tip of the state. LeBlanc is a French surname that translates to “the White,” so it is no surprise that the LeBlancs adopted White as their family name. Roland grew up in a musical family. His father, Eric, Sr., played fiddle, guitar, tenor banjo, and harmonica, and several uncles played piano and guitar. At family gatherings, young Roland and sister Joanne would join in the music making by singing. Not long afterwards, Roland began learning to play guitar. At Roland’s insistence, his younger brothers were enlisted in a burgeoning family band. Eric, Jr. played tenor banjo, Roland played mandolin, and Clarence played guitar; sister Joanne played bass. The group took its cues from traditional country acts of the day. In 1954, the White family relocated to Burbank, California. There, the family band morphed into the Three Country Boys, which was composed of Clarence, Roland, and Eric. The group’s first place status in an October 1955 Pasadena talent contest, hosted by Carl “Squeakin’ Deacon” Moore of radio station KXLA, led to regular appearances on regional television programs such as the County Barndance Jubilee, Town Hall Party, and Hometown Jubilee. It was also in 1955 that the group gravitated towards what came to be known as bluegrass, after Roland bought a recording by Bill Monroe. Around 1960, the Country Boys were appearing at the Ash Grove, a trendy Hollywood coffee house owned by Ed Pearl. A CBS cameraman caught a performance of the Country Boys at the Ash Grove and, impressed with what he heard and saw, forwarded his feedback to producers at the Andy Griffith Show. Shortly afterwards, the group received a call asking if they would be interested in appearing on the program. The Country Boys subsequently appeared in two episodes of the Griffith show. Mayberry on Record, which aired on February 13, 1961, featured Roland. April of that same year saw the second 45-rpm release by the Country Boys. Two songs, “On The Mountain (Stands My Love)” and “Valley Below,” appeared on the Republic label. But, it was the Griffith show that landed the group in Capitol Records’ Hollywood studio to record four tunes. These appeared on a November 1961 album called Songs, Themes and Laughs from the Andy Griffith Show. In 1964 and 1965 they made appearances at the Newport Folk Festival and clubs and coffeehouses across the country, including Gerde’s Folk City in New York, Club 47 in Cambridge, Massachusetts, and frequent runs at the Ash Grove. But as the public’s taste turned toward rock n’ roll, work for bluegrass and folk musicians became more scarce. At the end of October 1965, the group that had been in existence since the late 1950s—first as the Country Boys and later as the Kentucky Colonels—disbanded for lack of work. In the early part of 1969, Lester Flatt terminated his long-standing partnership with Earl Scruggs and formed his own group, which came to be known as the Nashville Grass. 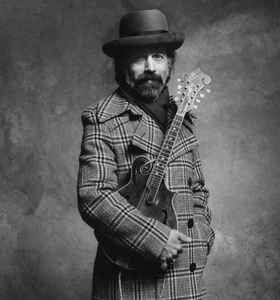 Roland was a charter member of the new group, where he returned to his more familiar role as a mandolin picker. While with Flatt, Roland performed on twenty-one different recording sessions that produced ninety-three songs and tunes. These were parceled out over nine albums including Flatt Out, The One And Only Lester Flatt, Flatt on Victor, Kentucky Ridgerunner, Foggy Mountain Breakdown, and Country Boy. There were also three memorable albums that paired Lester with his old singing partner Mac Wiseman: Lester ‘n’ Mac, On the South Bound, and Over the Hills to the Poorhouse. Roland left Lester Flatt in the latter part of January 1973. This coincided with the end of Clarence’s tenure with the Byrds. The White brothers reunited in a group they called The New Kentucky Colonels. They made one overseas tour in the spring of the year and returned to the States for appearances on the east and west coasts. The reunion was tragically cut short in July, when Clarence was killed by a drunk driver. Roland’s next stint began immediately after Clarence’s death when he joined Country Gazette, a popular Los Angeles-based band. Members at the time of his joining included banjoist Alan Munde, bass player Roger Bush, and fiddler Byron Berline. The group’s blending of bluegrass and country-rock did much to foster the progressive movement in bluegrass in the United States and secured a loyal following for the group in Europe. Among the albums released while Roland was in the band are Live, Out to Lunch, What a Way to Make a Living, All This and Money Too?, American and Clean, America’s Bluegrass Band, Bluegrass Tonight, and Strictly Instrumental. While working with Country Gazette, Roland released his first solo album, I Wasn’t Born to Rock ‘n’Roll. With backing by the Gazette, the album featured a mixture of traditional and contemporary material. Included were two tips of the hat to his former employers with “If I Should Wander Back Tonight” (Lester Flatt) and “Can’t You Hear Me Calling” (Bill Monroe). Roland continued to keep a finger in traditional bluegrass when he teamed up with luminaries Bela Fleck, Blaine Sprouse, Pat Enright, Mark Hembree, and Jerry Douglas to form a studio band known as the Dreadful Snakes. Taking their name from the title of an early 1950s Bill Monroe song called “The Little Girl and the Dreadful Snake,” the group’s album Snakes Alive was touted as one of the highpoints of recorded bluegrass during the 1980s. While Roland continued to work with the Country Gazette through the end of that decade, the Dreadful Snakes morphed into what would become the next stop on Roland’s bluegrass journey. Pat Enright and Mark Hembree joined forces with banjo player Alan O’Bryant and Monroe-styled mandolin player Mike Compton to form the Nashville Bluegrass Band in 1984. Rooted in tradition but with an eye to the present, the Nashville Bluegrass Band became one of the top groups on the circuit during the 1980s and ‘90s. When Compton took his leave from the group in 1989, Roland stepped in for what would be an eleven-year stay. During Roland’s tenure with NBB, he appeared on five albums, including The Boys Are Back in Town, Home of the Blues, Waitin’ for the Hard Times to Go, Unleashed, and American Beauty. All of these received Grammy nominations and two received awards for Best Bluegrass Album. While with the Nashville Bluegrass Band, Roland recorded his second solo album, Trying To Get To You. Roland’s most recent work has been with his own Roland White Band, which he organized in 2000. The current incarnation of the group features Roland’s wife, Diane Bouska, on guitar, Richard Bailey on banjo, Brian Christianson on fiddle, and Jon Weisberger on bass. The band’s debut recording, Jelly On My Tofu, received a Grammy nomination for Best Bluegrass Album. In addition to recordings with the bands he has been associated with over the years, Roland has been asked to contribute his talents to a host of other recordings. The list of albums he has appeared on reads like a “Who’s Who” with the likes of Joe Greene, Muleskinner, Alan Munde, Butch Robins, Buck White, Bobby Hicks, Joe Carr, Doc Watson, David Grier, Stuart Duncan, Marty Stuart, Clint Black, Valerie Smith, Ricky Skaggs, and others. Several award-winning albums he helped with are True Life Blues (IBMA Album of the Year/Recorded Event) and Becky Buller’s Southern Flavor (IBMA Recorded Event). Roland’s music is also heard in the soundtrack to two films: O Brother, Where Art Thou? and Dead Man Walking. As a mandolin virtuoso, Roland has become an in-demand instructor at a host of mandolin camps and workshops. He has co-authored a number of instructional books with Diane Bouska including Roland White’s Approach to Bluegrass Mandolin, The Essential Clarence White Bluegrass Guitar Leads, Roland White’s Mandolin Christmas, and Roland White’s Christmas Chord Book. 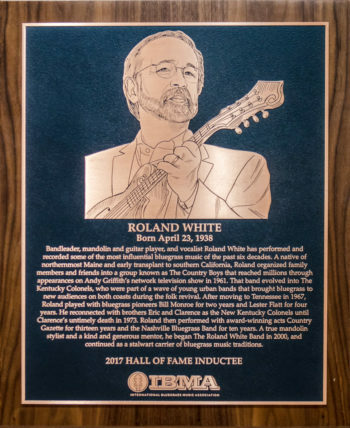 For a lifetime of excellence in the performance of bluegrass music, Roland has been honored with several awards, including induction into the Society for the Preservation of Bluegrass Music (SPBGMA) Preservation Hall of Greats (2010), a Distinguished Achievement Award from IBMA (2011), and induction into the IBMA Hall of Honor in 2017. Gary Reid is a bluegrass music historian, journalist, producer, and actor based in Roanoke, Virginia. It was Christmas Eve of 1956 on a show called Town Hall Party, I was watching him [Bill Monroe] and I had my mandolin in hand. In fact, that’s how I learned to do mandolin chords. It was a real eye opener to see how Monroe was holding his hands. Quoted by Joe Romano in “Roland White—A Voice in the Inner Circle,” Bluegrass Now, September/October 1996. Clarence called me in early ‘73 when I was still with Lester Flatt and told me he was out of the Byrds. He said Eddie Ticknor, who was the manager for the Byrds, was going to manage him, and he had quite a few places in Europe he could put us. Clarence asked me if I was interested, and how was the job going with Lester. I said, ‘OK, but it’s been about four years.’ We could go to Europe, get Eric [brother Eric White] and Herb Pedersen to do it. I said, ‘All it takes is you telling me we’re doing it, and I’ll turn in my notice.’ Four years is a good amount of time, and I really wanted to play with Clarence. And it happened. Quoted by Bob Moses in “A Record of His Own: Roland White’s Solo Reissued,” No Depression, posted June 2, 2010.